The other way of providing Data Center Interconnectivity besides OTV is VxLAN. VxLAN has ben developed through a few years and despite at the beginning was considered as a solution that enabled spanning VLANs across the single Data Center, nowadays is considered as a solution equal or even better to compare with OTV and enables us spanning VLANs across different geographical locations. Why would you want to use VxLANs ? Let me give you the one of examples. There is a feature that is called vMotion in vmware that enables moving any virtual machine between hosts in case when the host resources are running out. Let’s assume we have 2 ESXi hosts (servers). One of them is running 50 virtual machines, the other one 10. vMotion is able to detect this and can move the VM from one host to the other. So far nothing fancy especially if you are familiar with potential of vmware. Nothing, really? Unfortunatelly vMotion despite it is a cool feature requires L2 connectivity between hosts. When we move VM from one host to another via L3 environemnt that is the Spine-Leaf Fabric in modern Data Center, VxLAN comes to play, beacuse enables transport of L2 information through L3 transport via logical VNI tunnel. 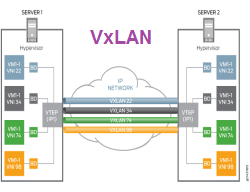 For VxLAN stands Virtual Extensible LAN. The technology that encapsulates ethernet frame in UDP tunnel (layer 2 in layer 3 overlay tunnel). The difference between old VLANs is, VLAN is 12 bit value (VLAN ID) and let us use up to 4095 VLAN, in VxLAN we use 24 bit value (VNI- VxLAN identifier) and we can use up to 16,777,216 VLANs. The VNI is a bridge domain, separate segment of the network that works on the top of layer 3. As an underlay layer 3 protocol that carries VxLAN we may use IS-IS or OSPF protocol. Because there is 50 bytes of overhead, we have to run “Jumbo frames”. VxLAN can be supported in hardware or software way (HyperV or ESX). If VxLAN works as an overlay on the top on layer 3 that means, we don’t have to worry about Spanning Tree Protocol, also we get Equal Cost Multi Path, because all links in the fabric are active, layer 3 and take part in the routing process. Each VNI is mapped to a single Multi Cast group, each multi cast group can be mapped to a few VNIs. When VTEP interface is online, it uses IGMP and joins to the multicast group that uses a specified VNI for sepcified VLAN. VTEP doesn’t have to join to the group that cointains VNIs that VTEP doesn’t use. Multicast is very well scalable. Is an alternative to multicast, if we have access only to unicast network. When BUM traffic arrives the VTEP creates several unicast packets and sends each to remote VTEPs that uses given VNI. This is not so efficient as multicast and is not so well scalable also is fine solution for 20 VTEPs or less. Data Plane learning (Bridging) -similar to the ethernet standard, the same mechanism (Flood and Learn), works only at layer 2, there is no support for routing if we want to reach another network we have to use the external router, also if we want to route traffic between VNIs, it is simillar to ” the router on the stick” solution. Data plane learning is easier to deploy than Control Plane learning. Control Plane learning– MAC adresses of VTEP interfaces and hosts in the network are being learned before are needed. Switches are peering to each other by using iBGP and share addresses that they know about. They use EVPN address family, not default ipv4. Each switch run iBGP and maintains the neighberhood with the other switches as usual in full mesh topology. Thanks to this switches learn where are the other switches with VTEP interfaces. If we want, we may use VTEP authentication for better security and to avoid rogue switches. Hosts addresses are added to the local BGP processes on each switch, next are propagated to the other iBGP peers. If the HostA wants to reach the HostB, then switch connected to HostA knows where “the next hop VTEP” with HostB behind is, because maintains entire MAC addresses database with all Hosts and Switches. In this way switches don’t have to send local ARP queries to the other switches. If it happens that the switch doesn’t have needed MAC address in its database, then ARP query is proceed by Multicast or Head End Replication. When we use “Control Plane learning” method and BGP EVPN we may use integrated routing and bridging. Unlike “Data Plane learning” we don’t need external router to provide routing between VNIs. VNI may be configured as L3VNI or L2VNI, because L2 and L3 information is carrying by BGP. L2VNI is being used for bridging, forwarding frames within the same VNI (segment), L3VNI is being used for routing between VNIs. VTEPs know about L2VNIs that serve locally and L3VNIs thanks to that can support the feature called “Anycast Gateway”. Each switch keeps the same default gateway (the same IP and MAC virtual address) within each VNI for the hosts.Thanks to this each host within the same VNI has the same default gateway, regardless which switch is connected to. This feature enables moving virtual machines between switches.. In order to support multi tenancy, Layer 3 VNIs are attached to the VRFs if we use MPLS L3 VPN. Firstly we gonna configure VxLAN feature on CSR routers in GNS3, next I will show how it looks on Nexus switches. Simple PIM Sparse mode is unidirectional, bidirectional PIM allows for sending traffic back and forth, The rest is the same as in Sparse mode. Also we configure OSPF in the Core. Under Inside Gigabitethernet 2 we configure service instances for each VLAN that we are going to carry further over VxLANs. Service instance is a logical interface that connects bridge domain to a physical interface. We create NVE interfaces (VTEPs), separate NVE for each VNI (each VxLAN). Also each NVE has its own ip address “borrowed” from the loopbacks interfaces. Each VNI is mapped to different multicast group. Now, let’s make some verification from the CSR1 point of view. I am going to configure VxLANs on NX-OS with using of Data Plane learning (Flood and Learn). 2 switches are linked directly (underlay IP network). 3rd Mapping VLAN to VNI. We define VLAN 1000 for the hosts and maps its to VNI 5000. We may need to run but only on NX-OS before 7.3 below command that changing the routing template. It needs rebooting. Let’s stopp for a while. This is something different to compare with CSR/ We have the same addresses 3.3.3.3 of the loopbacks interfaces on both switches configured as a Randesvouz Points. It is possible when we use “anycast-rp“. We state that we have redundant RPs. We point out how to reach them (next hop is the VTEP interface, our own and the neighbor). Instead of having RP somewhere in the Core, now we have configured RP on locall switch and remote switch.